Paul Dunton & Guests presents a superb series of candlelit showcases of the local area's finest soloists and acoustic bands. With four acts on the bill at each show representing a multitude of musical styles and genres, audiences are treated to an exceptional night of local music culture, songwriting and musicianship. 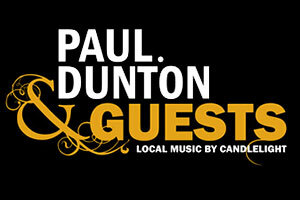 Paul Dunton & Guests takes place on most Wednesday and Sundays. Published acts may change at short notice.